Maybe you don’t read as many magazines as I do. Maybe now you are wondering if you are normal. Perhaps you are worried you’re not. Perhaps you should be. 1. Your darling child who usually sleep until about 6:30am, maybe 6:45am if you are lucky and the stars are in alignment, is still sleeping at 8:15am on a Monday morning. Your reaction? B) Why? Why? Why, for the love of everything good and holy, can’t he do this on a WEEKEND morning? 2. You plan to go swimming over your lunch hour but due to forces beyond your control you can’t go. What do you do? 3. It is a beautiful sunny day. Your spouse is working late and won’t be home for hours. Do you take your child outside to play? B) Yes, because it is vitally important that he get outside, run a lot, wear himself down and go down early for bed tonight. 4. Your jeans keep falling down. You? A) Throw them away and vow to try on as many pairs of jeans as it takes to find a pair that really fits you well. B) Throw them in the wash and vow to stop wearing them 12 times in a row between washes. Trust the dry to shrink them back. A) You check your email every hour and respond as quickly as possible. While your child naps you return phone calls. B) You check your email first thing in the morning, don’t reply to anything and read blogs and eat monkey bread while your child naps. 6. True or False: If McDonald’s delivered to the boondocks, you’d be having french fries and chicken nuggets right now. B) True, oh so true. 7. You are outside playing with your boy and you see a snake. Does this freak you out as much as seeing a mouse in the kitchen? 8. You are outside playing with your boy and you see a snake. You consider showing it to the boy but you have a safety concern. Whose safety are you concerned for? The scoring: The more “B” answers you picked, the more totally normal and well-adjusted you are. The more “A” answers you picked, well, let’s just say you need to try harder. 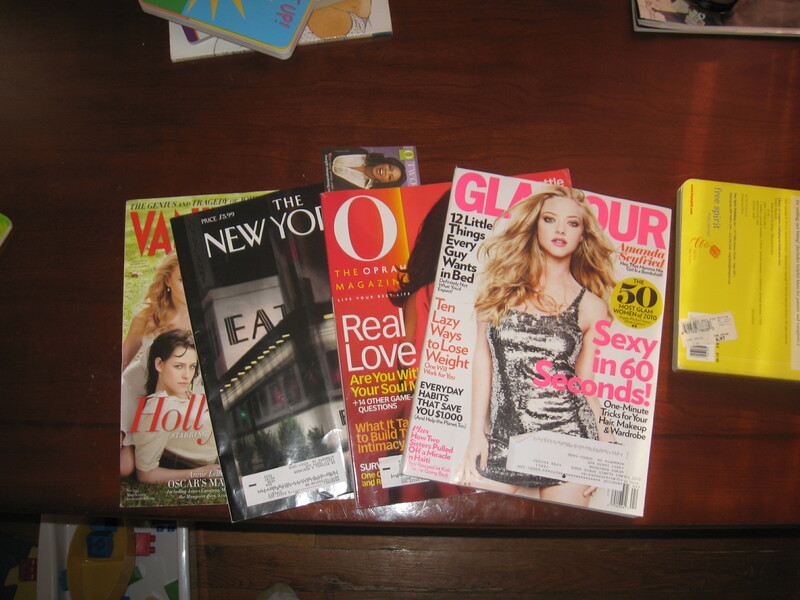 * Vanity Fair, Glamour, Ladies Home Journal, Runners World, The New Yorker, Oprah, Real Simple. Judge away…or try to guess which ones were freebies. Oh good, now I don’t feel so bad about all of the magazines that we get: Entertainment Weekly, Allure, Teen Vogue, Dog Fancy, Coastal Living, Sports Illustrated, Details, etc. We were members of a frequent flyer program for an airline that merged with another so they sent us an offer to redeem our miles through magazine subscriptions. We now get over 2000 miles worth of magazines and I’m kind of looking forward to them expiring so I can fill my mailbox with magazines I really want. That’s hilarious! I had a 2-year subscription to Better Homes & Gardens and wanted out after about 6 months but they just kept coming, and coming, and coming.